A treat made popular by students at women's colleges! Anyone who's been around me over the last couple months has heard me talking about how excited I am to finally have time to work on my blog again. I've been managing about four posts per month since January, something I wasn't even close to hitting while I was in grad school. It's helped me feel so much more engaged with food history again too, and I've been inspired to start planning some really cool stuff for down the line posts. One of my favorite things I've been able to do with this blog is to really challenge myself with historical recipes that have limited instructions and require some know how and faith on the part of the modern cook. Five years into this blog, I've gotten good enough at baking that I can pretty confidently throw together cakes and cookies in this fashion. Candies... not so much, as it turns out! Read on to see my attempts at making fudge from a 1903 recipe. 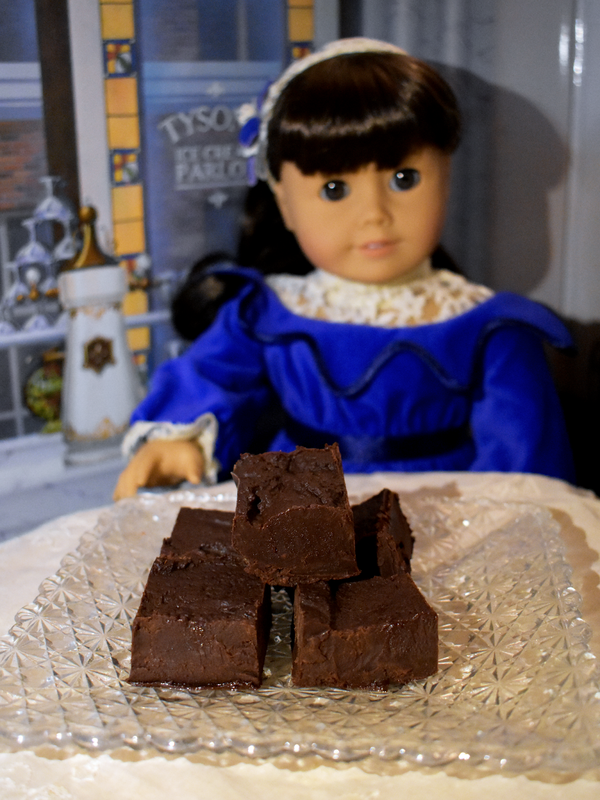 You might be surprised to learn that fudge as we know it is a relatively modern invention. According to The Food Timeline - one of my very favorite online resources for food history! - modern fudge can probably trace its roots back to the 1880's in Michigan, where it was sold to vacationers to Mackinac Island. Other stories credit Emelyn Battersby Hartridge with making the confection popular while she was at Vassar College. She would make fudge and sell it to her fellow co-eds. Other sources makes it sound as though making fudge was a common hobby among students at Vassar, and the trend was picked up by other women's colleges. Although chocolate would relatively quickly be introduced as a flavor, the earliest recipes for fudge were pretty simple: butter, sugar, milk and vanilla extract. Until the mixture hardens when dropped into cold water. That's right, this recipe for candy doesn't include instructions for using a candy thermometer. Makes sense, considering the average Turn of the Century housewife or college co-ed didn't always have access to one. Candy thermometers only became common in personal kitchens in the early 1900's, gaining in popularity through the pre-war period as they popped up in more advertisements and cookbooks. This one doesn't give instructions for a candy thermometer, which means they're expecting you don't have access to one and will go based on sight and feel rather than temperature. Having never made fudge truly from scratch before, I was definitely pleased to discover that it seemed like the fudge was indeed getting hard in cold water. Not a very pleasant photo to show you that, though. I poured the mixture into a lined baking dish and set it aside to cool. This is where I made a big mistake. I got impatient for it to cool and put it in the fridge to help it along. This is what I've done with other fudges I've made in the past with evaporated milk, and in all honesty I'm not skilled or knowledgeable enough about making candy to have questioned myself too thoroughly in this thought process. What could go wrong, right? Well, after a little bit of time in the fridge, the fudge started to crystallize pretty badly. When you cool sugar too quickly, it forms larger crystals than if you let it cool slowly. It made the fudge terribly grainy, and it never really firmed up beyond a really wet caramel texture. Since I don't have any information about what this fudge is supposed to taste like, I'm not sure if the wetness even after cooling to room temperature and then chilling in the fridge is another mistake, or if it's meant to be a little looser than the fudge you might pick up from a confectioner's in 2019. I decided to try a second batch, and that went even worse. Instead of remaining in a nice, gooey liquid, the sugar never really seemed to melt properly and I basically ended up with chocolate flavored sugar with the exact texture of brown sugar. Frustrated, and wanting something to photograph, I decided to make the microwave fudge I used to make as a high schooler for Christmas swaps: microwave three cups of chocolate chips, a can of sweetened condensed milk, and 1/4 of a cup of butter for about three minutes. Mix everything together until they're all well combined and melted, then pour into a prepared baking dish and chill until firm. 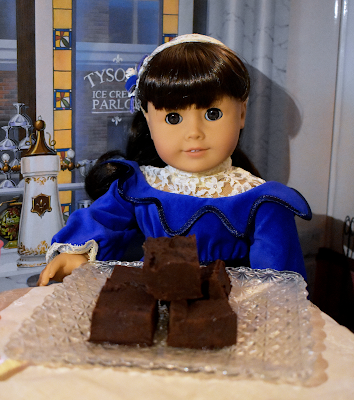 Viola: fudge. 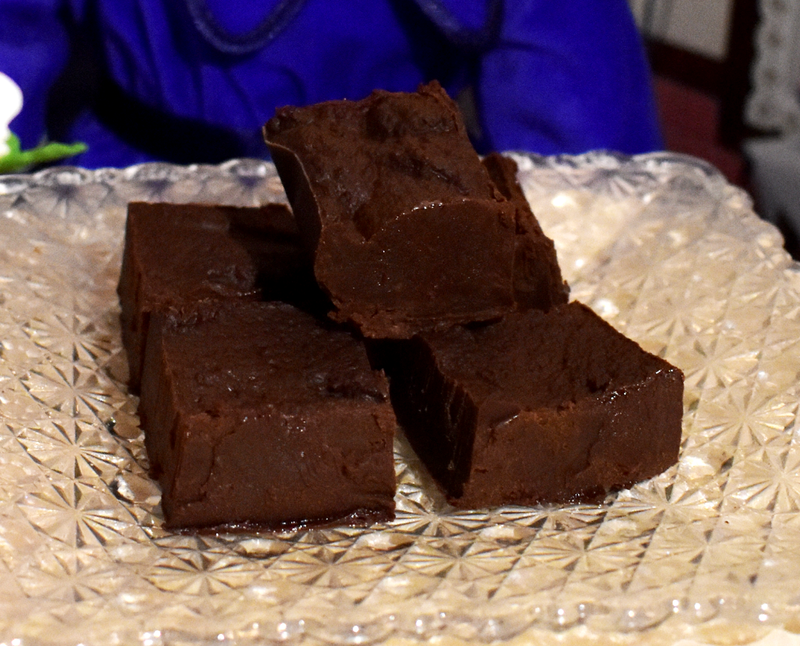 This fudge is tasty and has the perfect texture every time. For someone like me who doesn't actually really like making candy - probably because I just haven't done it often and am afraid of burning myself or the batch - this is the perfect solution to making something homemade that seems like you put a lot of effort into it, but really it was nice and stress free. I'm very curious about what a curious Turn of the Century cook might have done with this recipe, and if it would have proved as challenging for someone who might not have even eaten fudge, let alone made it themselves before. So, moral of the story: if you're making fudge from scratch the old fashioned way, consider picking up a candy thermometer. If you insist on going without, be patient and let the fudge cool on the counter instead of sticking it in the fridge. Or, do what I did, and make microwave fudge. Much easier, and the results are just as tasty! Modern conveniences sure do come in handy in times like these! Wow! I wish I knew what caused the awful texture! I made fudge once (orange-cream flavored, not chocolate), and had no issues, despite not having a candy thermometer. But after boiling, instead of the cold-water test, I dropped a bit of the mixture onto a plate; if it was too firm to drip, but was still soft when poked, it was ready. There are too many ingredient differences between our recipes to make an apples-to-apples comparison, but somehow I feel like your recipe calls for an awful lot of sugar... I dunno. But I like your microwave fudge idea! The graininess in the original batch is because the sugar was cooled too quickly like I said in the post, so it formed bigger crystals than it should have. If I'd let it cool more slowly, it would have maintained the original gooey but smooth texture. I think if I'd been patient and let it sit until it had cooled completely, it would have hardened to a similar point as a soft caramel, so still sticky, but easier to eat with your hands. Interesting to hear about how the refrigeration caused that kind of crystallization. Annoying as I'm sure it was, I love the experimentation side of cooking so the failures are sometimes more interesting than the successes! This has me feeling inspired even though I've never tried making fudge. I know my mother used to make an annual fudge wreath for school events when I was a kid. I'll have to ask her if she still has her recipe (and see how it compares to yours). Would love to hear how it turns out if you find it! I'm definitely curious to give other recipes a shot now that I know a little more about how the process works. 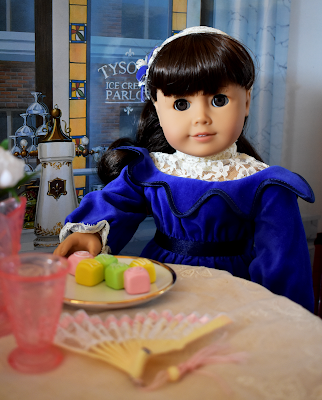 Welcome to A Peek into the Pantry! A Peek into the Pantry features recipes - both historical and modern - inspired by the Historical Character line from American Girl. It's run by me: a Public Historian named Gwen. 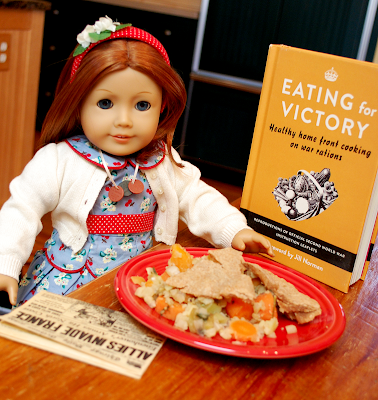 I got the idea for this blog when I realized I might be able to trick myself into learn how to cook by trying out historic recipes and learning the history behind different dishes we enjoy today. I'm definitely not an ace in the kitchen yet, but I think I've made some progress since I started, and hopefully you've learned a thing or two, too! Don't forget to follow me on Instagram @apeekintothepantry for blog updates and news! I am not affiliated with American Girl, Mattel, or any of the associated companies, and no one is sending me stuff for free. I take my own pictures, buy my own ingredients, and credit every recipe I use to its proper owner. In no way am I trying to attribute other people's work to myself.